The ones, that have survived the killer liquid, know that, they had consumed hooch in medicine bottles. The Chief Minister and his government also know that 40 persons have succumbed to hooch. That’s why the CM’s close friend A.U.Singhdeo, holding as he was the excise portfolio, had to resign from the cabinet and the excise commissioner had to hand over his charges. But, now, the Orissa Assembly in session, has been fed with the information that the killer liquid was not spurious liquor, but was medicine available in drug stores sans any prescription. Surprisingly, a Congress member Sadhu Nepak had put the lead question. His query was a statement seeking an answer. In Balianta and Barang areas, he stated, people died by taking poisonous medicine and wanted to know as to what steps the government, in view of this, has taken to inspect regularly the medicine manufacturing units and medicine shops in the State. He did not stay to attend to his question and had authorized another Congress member Anup Sai to handle it on his behalf. The Minister replied that there is nothing like poisonous medicine. But there are drugs, with possibility of being spurious, to purchase which, no prescription is required under the Rules. It is provided under the Drug and Cosmetic Rules, 1945, the Minister said, that, drugs placed under schedule H and X thereof must be sold under prescription and drugs not under these two schedules can be sold sans prescription. The State Government has no control over that. The Minister further said, in these non-scheduled drugs, manufacturers may use alcohol as they deem necessary. But, in place of ethyl alcohol, which is permissible, if they use methyl alcohol, that may affect eye sight and may even lead to death. Yet, he said, the State Government cannot ban production thereof, as it is the Central Government, which alone is empowered to impose any such prohibition. He cited how in 1999 and 2000 the State Government’s ban order on one such killing agent used in non-prescription drugs was nullified by the Orissa High Court on the ground that the State had no jurisdiction to impose such a ban without permission of the Central Government. The House went into a pandemonium over the issue, as the Leader of Opposition Bhupinder Singh came down heavily upon the CM’s politics of resignation of Ministers when he, in events like the tragedy that forms the crux of the instant question, falls in critical junctures and needs to save his skin. But the hit of Singh’s intervention by way of supplementary question, jerked the treasury benches to their feet when what he said generated insinuations that the CM has sacrificed A.U.Singhdeo, a minister of his own camp to save his skin, while not daring to touch the Health Minister Prasanna Acharya, despite the deaths now being attributed to spurious medicine that comes under the portfolio of Health, because he belongs to the other camp headed by Pyari Mohan Mohapatra. The pandemonium swayed away the real issue. And, resultantly the House could not make the Minister answerable on the severest massacre of the year perpetrated by a producer of non-prescription drugs – if that’s the position pending the Judicial Commission of Inquiry – as neither the Congress nor any in the Opposition could ask, as to why the State Government had/has not sought for permission of the Central Government to ban the spurious medicine that, according to what the Minister told the House, took the toll of so many lives. Politics, thy name is the art of hoodwinking the innocent people in a system called democracy! Howsoever smart be a lier, truth occasionally comes out through unattended crevices in the iron wall of secrecy. Such a truth has come out in Orissa Assembly on February 23 that exposes how ugly is Orissa administration despite claim of honesty. And, it has come out in the answer of mass education Minister Pratap Jena to a question on the ‘Sarva Shiksha Abhiyan’ (SSA), that the Central Government principally funds to achieve the goal of Universalization of Elementary Education of Satisfactory quality within a stipulated time. The lackluster approach to SSA coupled with corruption by Orissa officials has earlier been discussed in these pages. But what the minister has told the House exposes to what suicidal extent the officials have corrupted it. He has told the House that majority of District Collectors have drawn several lakhs of Rupees each towards expenses on their tour vehicles without even paying a single visit to any SSA center. They are all pampered officers of the government. The Minister’s reply reveals that out of 30 districts of the State, except only one district, i.e. Debgarh, all the other 29 Collectors have drawn massive amount of funds for their luxurious tour to SSA sites whereas 20 of them have drawn huge money on account of vehicles for their inspection of SSA units without any visit to any of them. According to the Minister, a total of Rs.22.64 lakhs has been drawn towards rent and fuel of tour vehicle of the Collector of Koraput district, whereas the money drawn on this head by the Collector of Nayagarh is Rs.15.30 lakhs, by the Collector of Bargarh is Rs. 15.24 lakhs, by the Collector of Angul is Rs. 8.94 lakhs, by the Collector of Cuttack is Rs.12.72 lakhs, by the Collector of Dhenkanal is Rs. 11.83 lakhs, by the Collector of Ganjam is Rs. 8.17 lakhs, by the Collector of Jagatsinghpur is Rs. 11.75 lakhs, by the Collector of Jajpur is Rs.2.19 lakhs, by the Collector of Kalahandi is Rs.1.95 lakhs, by the Collector of Keonjhar is Rs.3.30 lakhs, by the Collector of Khurda is Rs. 10.28 lakhs, by the Collector of Malkangiri is Rs.13.89 lakhs, by the Collector of Mayurbhanj is Rs. 11.70 lakhs, by the Collector of Puri is Rs.9.92 lakhs, by the Collector of Rayagaga is Rs.11.04 lakhs, by the Collector of Sonepur is Rs. 7.23 lakhs and by the Collector of Sundergarh is Rs.5.94 lakhs, even though none of these Collectors have ever visited any SSA unit in their respective districts. It is shocking that in districts like Koraput, Kalahandi, Malkangiri, Sundergarh, Keonjhar, Mayurbhanj, Nayagarh and the Chief Minister’s home district Ganjam, where education is so marginal and poverty, linked to lack of education, is so very rampant that SSA could have emerged as a boon, the Collectors have looted the scheme by false bills on luxurious cars claimed to have been used by them for inspection of implementation of the scheme even though they have never gone to a single spot. The other 9 district Collectors, except perhaps Bhadrak, are not also above board. The SSA projects they have visited do not justify the fabulous amount of money they have drawn on vehicle heads. When Bhadrak Collector has inspected 1330 projects against expenditure of Rs.5.59 lakhs on vehicles, the Nawarangpur Collector has drawn Rs. 11.13 lakhs towards vehicle for visiting mere 158 projects. The scenario in other very backward districts is not different. As for instance, the Collector of Kandhamal has inspected only 125 SSA centers, but drawn Rs. 8.82 lakhs for vehicles. Collector of Nuapada has visited only 75 centers as against spending of Rs.5.90 lakhs on vehicle, whereas Kendrapada Collector has spent Rs.13.95 lakhs for tour to 108 centers and the Sambalpur Collector has drawn Rs.14.57 lakhs against visit to only 59 projects under the scheme. When Balasore Collector has visited 912 projects and drawn Rs.11.52 lakhs towards rent and fuel of his tour vehicle, Collector of Balangir has drawn 6.51 lakhs on vehicle head to tour 458 centers, but the Collector of Jharsuguda has visited only 27 centers spending 2.41 lakhs from the funds of the scheme on rented vehicles. Sad, the Assembly has not paid due attention to this serious assault on the centrally funded scheme by the very officers under whose care and control the projects are left. As we gather from sources under pledge of secrecy, Collectors have misappropriated this fund in nexus with leaders of the ruling party and personnels in charge of accounts in their respective offices. In some cases, Collectors have purchased sophisticated AC cars in names of relations and taken the same on higher rent for the purpose of their tours under the scheme, but have drawn the money against false bills without subjecting the vehicles to rigors of the roads. This is a fit case for separate specific discussion in the Assembly. But with majority of members in the Chief Minister’s pocket, this may not be possible; because, if a specific debate is allowed, it is the Chief Minister, who would be most embarrassed. Under the scheme, when the Prime Minister heads the SSA Mission in Central level, the CM heads it in the State level. It is clear, therefore, that the Orissa CM has not done his duty to the mission or has deliberately kept his eyes closed to what his blue-eyed boys in the districts have been doing, as nobody who is not in his good book is placed in charge of a district as Collector. Several of the kings in pre-independence India specifically in Orissa were so tyrant that they had imposed on the people they were torturing a tax called PITUNI KARA which was a fine in cash for being beaten. The masses ultimately woke up against such tyranny and the kings were so thrashed that they had to abdicate their thrones and merge their States in independent India. When Congress misrule surpassed the limits, in several States in India, people refused to grant a fresh mandate to this party of the factotums of Nehru family in 1967 and thus in Orissa, one of the former kings, R.N.Singhdeo managed to form a ministry in coalition with Jan Congress, comprising Congress members opposed to Nehru family hegemony. Corruption in the state acquired elite status and defamation of political opponents and victimization of bureaucrats who did not dance to the tune of the CM’s proteges became the norms of the day. Hypocrisy stood for administration. And, as people got disillusioned, protests galore, Singhdeo with many ex-kings in his segment of the coalition, wanted PITUNI TAX to be imposed on areas where organized resistance to what he called governance, was discernible. It was strongly resented to in Orissa. Fissure in the coalition grew and the Jan Congress withdrew from the coalition. Government collapsed. People refused to give mandate to Singhdeo. Like a house of cards, his party – the Swatantra Party – also collapsed and got obliterated from political sky of India. Emboldened by repeated return to power, Chief Minister Naveen Patnaik, who by sheer misuse of power has reduced Orissa to a Bijudom by naming and renaming utmost majority of public institutes and welfare projects after his father Biju Patnaik with himself as its preening prince, has revived the PITUNI TAX of the kings’ concept, as informed, exploited and tortured people in rising numbers in every segment of society are demonstrating their protests against ongoing misrule. This time, the Bhubaneswar Municipal Corporation is being used as the medium of this punishment to still even the still small voices. It would be wrong not to say that, in Orissa, the Governments in succession have gone against the people to please private industries and traders who prosper at the cost of the masses, as thereby, they, who run the Government, fetch fabulous financial gain. In the process, people have been left at the mercy of exploiters and a climate of oppression and opportunism has engulfed administration pushing the entire working class – both in public and private sector – and self-employed ones – mostly in agriculture sector – into colonized condition. Naturally, people must protest. One of the governments, run by J.B.Patnaik, sensing that protests in front of the citadel of power would obviously be by the well-informed ones and hence of immense impact, had contrived a method of obstructing all such protests against misrule and all possible campaigns for any alternative, by converting the vast open space kept by the original planners in front of the State Secretariat for such democratic activities, to a park named after Indira Gandhi after her demise. People of Orissa, after that, like they had thrown down Singhdeo to dustbin of time, thrashed the Congress out of office. But, since the conversion of the democracy point to Indira Gandhi Park, despite the Governments’ insistence that people should express their concerns and/or protests in the Janata Maidan, away from the Secretariat, victims of government apathy and injustice were using the boulevards adjacent to the said park, spanning in front of the Sate Assembly up to the Master canteen square, to demonstrate their protests. Rallies and Dharana demonstrations were also being staged by the general public in expression of solidarity with the victims such as the ones conducted when the Naveen Patnaik Government became a butcher in Kalinga Nagar or its police became protector of the rapists in Pipili. Naveen has now enhanced JB’s restrictive tactics against voices of mass conscience by imposing a PITUNI TAX in a different form. Be it noted that the Government of Orissa rules from the City of Bhubaneswar. And, the City is run by Bhubaneswar Municipal Corporation that lives under the pleasure of the Urban Development Department of the Government. Though managed on records by an elected body of ward representatives headed by a Mayor, the BMC is controlled by the Government through Laws enacted and enforced by it, through Government instructions and notifications leashing or unleashing its activities and through Government officers that administer it. Now, this BMC has been used to tax the demonstrators to the tune of Rs.1000/- for staging their demonstration with the rider that the amount shall be recovered with penalty from leader(s)/organizer(s) of demonstration(s) if the tax amount is not paid in advance. 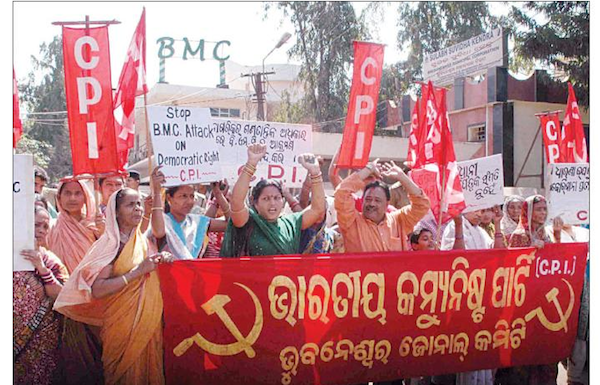 We mark that the Communist Party of India has staged a protest demonstration in front of the BMC office while demanding instant withdrawal of the new version of PITUNI TAX. We deem it proper to warn the Government that if ventilation of people’s resentment against misrule is thus obstructed, the inevitable outburst of the tortured people’s wrath would be too sharp for the administration to overcome. From the former kings of Orissa who had imposed PITUNI KARA on their subjects to the former ruler of Balangir who in the attire of Orissa’s Chief Minister had taken steps to enforce PITUNI TAX, to a former journalist who had become the first CM to rule the State for a decade – all were thrashed to the dustbin by people of Orissa for having used devices to obstruct their voice against misrule. If Naveen fails to learn, it would be his mistake. This tax cannot be but anything other than a fine for being misruled in Orissa! It is better for Naveen to take note of it. Mother tongue and motherland are in Oriya concept equated with the mother. “ମାତୃଭାଷା ମାତୃଭୁମି ଉଭୟ ଜନନୀ”. Therefore, it is natural on part of every Oriya to know of what exactly the Orissa High Court has said while allowing the presentation of Sahitya Award 2011 by India’s National Academy of Letters to ‘Achihna Basabhumi’ (ଅଚିହ୍ନା ବାସଭୁମି) despite the book being a displayer of nasty words and expression of hatred against lower castes, women and muslims. On the plea that selection of this book as the best book in Oriya language for the national award was obtained through manipulation, a man of letters – Sricharan Pratap ‘Kaniska’ – had preferred a writ case before the High Court of Orissa, which was registered as W.P. (C) 1871 OF 2012 with a Misc Case numbering 1876/2012 that had resulted in a stay on the award. But subsequently on 14 February 2012, the Court lifted the stay and dismissed the case as not maintainable as a PIL, on the basis of which, the Academy has already presented the award to the writer of this book. As the people of Orissa – including the NROs – are also anxious to know what the High Court has really said, currently in a foreign tour, I tried to get it for my readers through the judgment site in the internet; but it was not available. I contacted the petitioner and from him I got the information that though he has applied for an urgent copy of the order, he has not yet got it, because the members of the bench – Chief Justice V. Gpal Gowda and Justice B.N.Mohapatra – have not yet signed the verdict. This position worsens the predicament. Presentation of the award by the Academy of Letters on 15 February following the rejection of the petition in the High Court, when the petitioner has not even got a copy of the order because the same is not signed by the judges, has given birth to a phenomenon that makes one see how eager was the Academy to give away the award, exposed in public platforms as manufactured through manipulations. To us, presentation of the national award to this book as the best one amongst Oriya books published in a given period of three years from 2007 to 2009 is an affront to the dignity of our language. We do not know, whether the judges have read this book or not; but we know the book is vitiated with so much obnoxious words and expression against the women, lower caste people and muslims that no sane society can vouch for it. A few samples of filth from the book are viewable in saubhasya.com. We are not producing the same here as that should be requiring translation thereof into English and if done, that may be very embarrassing to any Oriya who prides over majestic beauty of his mother tongue. This book in normal circumstances could never have earned national award as the most outstanding book in Oriya. But what for the High Court has cleared the book for the national award is not known to any in details as yet. Therefore the sooner the order is published or made available to the public, is better.